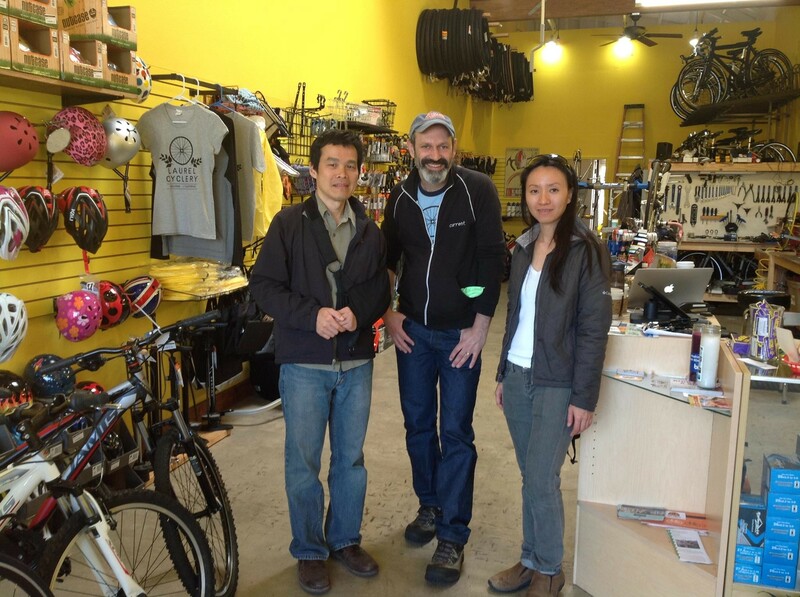 Laurel Cyclery owner Jason Wallach (center). Some parking spaces in Oakland aren't being used for cars anymore — instead, they’re being revamped and remodeled into small, urban parks known as “parklets.” As part of a program Oakland launched in September 2014, the city is allowing business districts and community organizations to transform select parking spots, unused bus stops, and other street spaces into miniature parks, which can feature public seating and bicycle parking. The newest parklet sponsor in Oakland is the Laurel Cyclery, a bicycle repair store and retailer in the Laurel District, which announced this week that it is moving forward with its proposal for a parklet outside of its shop at at 3715 MacArthur Boulevard. The shop is in the process of finalizing the designs for the parklet, which will replace two parallel car parking spots by the store. There are sixteen parklets in the works in Oakland as part of the city's new program, which aims to create accessible public spaces that can beautify neighborhoods and attract pedestrians and cyclists. Parklets, which have become popular in San Francisco, typically feature platforms that are built into the street and extend from the sidewalk to the road. Though the parklets are for public use, the city's initiative calls for business districts, nonprofits, and other groups to develop and sponsor specific proposals. Currently, the city is granting one-year permits to applicants, with opportunities for sponsors to renew them in subsequent years. Laurel Cyclery owner Jason Wallach said he initially had reservations about the concept, since parklets could be seen as a sign of gentrification. But given that the neighborhood is frequently congested with cars, he ultimately decided a parklet could provide a welcome community-oriented space rather than be a “beacon for white techies who come in from the city.” He continued, “We want to ensure that traditional residents are able to enjoy the benefits of the neighborhood and this space. This parklet is designed to be a place that anybody can come and hang out in the Laurel District." Wallach estimated that the total budget for the parklet — for permitting fees, design and construction — would be $21,000. He said he hopes to raise about $12,000 from individual donations, with the remainder coming from business sponsorships and other partners. The store launched a crowdfunding campaign to support the project and has so far raised more than $2,000.